As summer of 2010 approaches it’s time to get my ride ready for summer. I’m a person that likes to set goals, and in January I laid out 7 goals I wanted to accomplish (car and driving wise) in 2010. I don’t always achieve all of my goals….but this year is off to a good start as I am working on these two goals now to get my Chevelle ready for summer! Two years ago I had my 350 freshened up…..and now it’s time to do it again. During the last build we used chrome moly rings and a few of them just never seemed to seat. The engine ran strong but burned oil like crazy (the plugs fouled out if you drove it too long). There is probably nothing you do do more to hurt your street cred with car guys than to pull up in a cool looking car that’s belching out oil smoke. That’s gotta go – and this summer it is. Over the weekend a buddy and I yanked the engine out in just a few hours (another reason I love old cars) and the engine is already at the rebuild shop. My engine builder is a good friend and felt so bad for the problem that he’s doing the rebuild for free! I think the problems we ran into were somewhat of a fluke as he’s a pretty renown race engine builder for dirt track guys. His plan is to go through the engine, see if anything is obviously wrong, freshen everything up, and run cast rings this time. I’m just looking forward to not putting in a quart of oil with every tank of gas. I’m reaaaaaaaaaaaaaaly excited about this one. When my dad and I originally restored the Chevelle it was a 2-speed Powerglide (automatic) car, and I wanted nothing to do with it. I like to shift. We did a 4-speed conversion then, and I have run one (three of them, actually) ever since – until now! The PerfectFit Kit offsets the shifter and places it in the original shifter hole location (the TKO itself is a rail-style shifter in the center of the transmission). 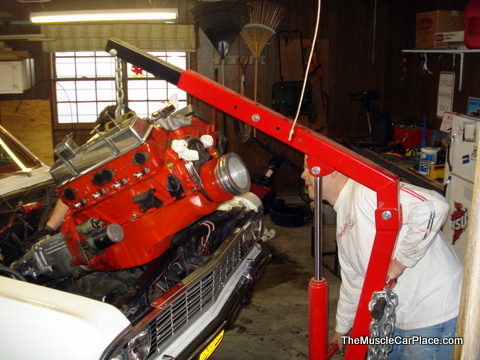 For 64-67 Chevelle’s, the TKO PerfectFit kit includes machining the top of the transmission off a little bit to help the trans fit in the original tunnel since the dimensions of the TKO are bigger than the old Muncie. I may still have to do a little sheet metal surgery to get it to fit, but it shouldn’t bee too much. Keisler includes replacement sheet metal and templates with their kit. I chose the .82 overdrive trans mainly because the first gear in that one was more usable with the 3.55 rear gear and 255/60/15 tire that I am running, and because the .82 fifth gear is still in the power band of my engine. The other TKO options from Keisler used different first gears that were too tall for me or had 5th gear ratio’s there were more out of the range that I wanted (.64 and .68). They hydraulic clutch actuator option was something that I splurged on. 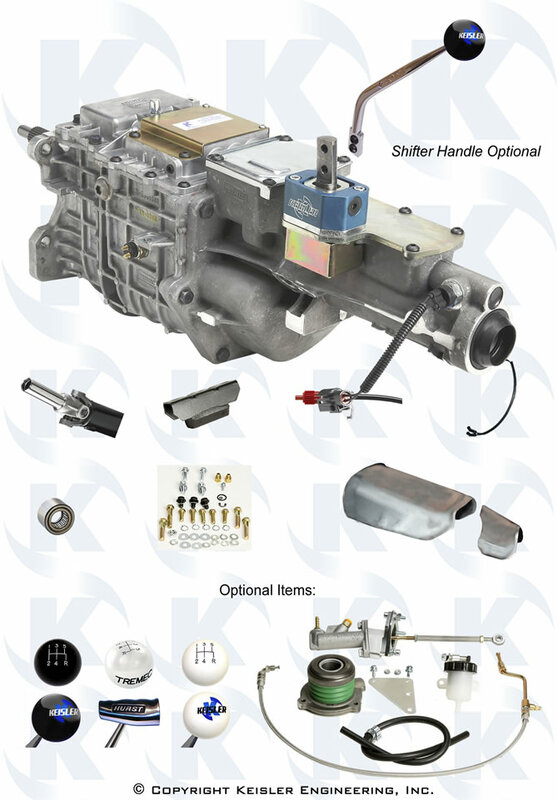 Should you wish to keep your stock mechanical clutch setup with the Keisler kit, you can. This is just something I’ve always wanted to do to increase the driveability of the car. The Keisler kit includes a new drive shaft that is made to fit your car. Once your transmission is in place you take a couple of measurements, send it to them, and then they send you a new one! I’ll report back later with details of how things have gone. My goal is to have everything buttoned up and ready to run for the 2010 Hot Rod Power Tour (which starts on June 5th at the Iowa Speedway)! I hope that you and your car are getting ready for summer season as well. Hammer down!